Winner – Best Single Image in the Exotic portfolio category: Tongi/northern border of Dhaka/Bangladesh. 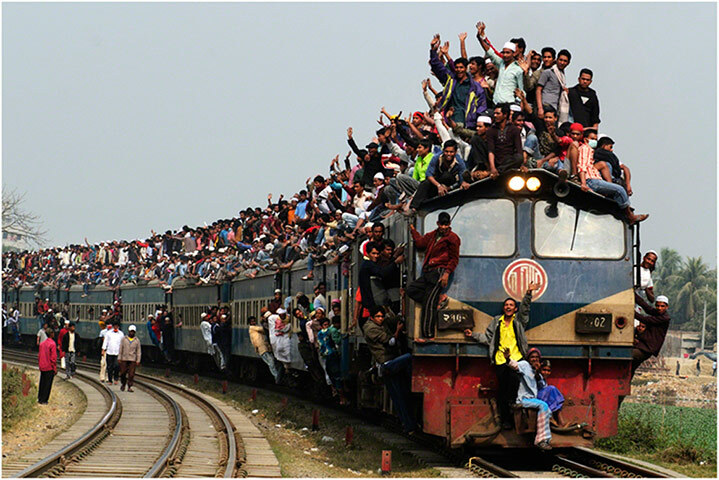 During the Muslim congregation, local residents arrived at and left the congregation by train. They climbed to top of the train and squeezed into every space they could find. Photograph: Yeow Kwang Yeo, TPOTY. Japan’s Kawasaki Heavy Industries Ltd. recently announced that it is developing the country’s fastest high speed train! Named the “Environmentally Friendly Super Express Train” (efSET), the modern marvel will propel passengers along at 217 miles per hour, besting the record-holding Shinkansen‘s 186mph. The streamlined design also promises to be less noisy, more energy efficient, and will feature a state-of-the-art electrical control system. Only a few years after trains first starting running in Japan back in the late 1800′s, and when it still took about 12 hours to travel from Tokyo to Osaka, the Ikoma Cable Railway was established in 1918 in the Kansai area. It is the oldest cable car company in Japan and is run by Kintetsu. The lines official name is Ikoma Cable Line (生駒鋼索線). Original picture source: flickr, dugspr, modified (cropped) under Creative Commons License. It is great to see that this historical line is still in operation today and that the rail cars have been upgraded to give tourists an even more entertaining experience. The trains certainly create quite a bit of attention and are a perfect tourist attraction for the area to complement the local theme park. With the results looking nicer than most nurseries, the Japanese have taken the idea of ‘child-friendly public transport’ to the next level. They were designed by Eiji Mitooka, the artistic force behind a couple of regional trains which travel on a daily basis on the 14.3km Kishigawa line in Japan. 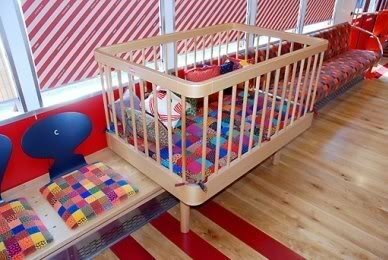 The train contains hundreds of toys, TV screens showing cartoons, immaculately clean wooden flooring and cots for younger children.